Chechen leader Ramzan Kadyrov might be the Russian Federation’s second most powerful figure. With such friends in high places, why would he need to make more online? Western media is fond of lampooning the leader of Chechnya's Instagram account. Ramzan Kadyrov’s earnest self-promotion as he holds a kitten, works out, or throws autumn leaves with childlike abandon is easy to belittle. By making token references to Kadyrov’s oppressive policies and human rights abuses journalists can easily avoid looking insensitive or opportunistic. Making a spectacle of the contrast between Kadyrov’s brutish reputation and his playful posts is now an accepted formula for clickbait. However, it might be more fruitful – and more honest – to see how the two phenomena reinforce each other. While Kadyrov’s stated purpose for maintaining his Instagram account is to monitor public opinion, he actually intends to improve his image to project cultural influence beyond Chechnya. Through Instagram, Kadyrov portrays his desired image of the Chechen nation – one in which his continued leadership is necessary for the nation’s survival. Chechen identity is popularly understood as opposed to Russia. The truth is more complex: Chechen clan identities, Islam, and different relationships to Russian power all contribute to diverse discourses on the Chechen nation. 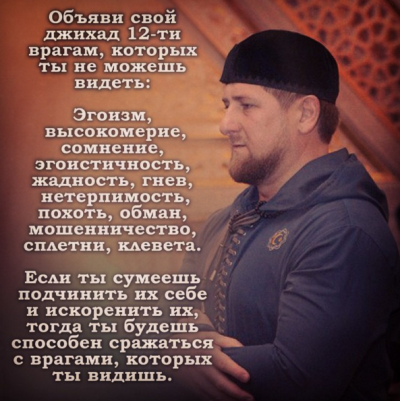 In Kadyrov’s posts to Instagram, Chechens are singularly pious (but not fundamentalist) Muslims who look up to Kadyrov. Crucially, they love Putin and Russia. In these communications, the Chechen audience plays a subordinated role. It is not that counter-hegemonic narratives do not exist in Chechnya; rather, they are stifled by censorship and overshadowed by Kadyrov’s worldview – even in complex media systems. Kadyrov strengthens his message by integrating elements from competing narratives. His Instagram posts include both aspects of traditional Chechen culture – folk music and dance – alongside aspects of a universal Islamic culture, such as religious songs in the Arabic language (nashid), which a majority of Chechens do not understand. The discourse is not 'Russian', but rather a unique kind of Chechenness that legitimates Kadyrov's power and is pro-Russian – a prerequisite of the Kremlin’s Chechenisation policy. Kadyrov’s promotion of a recontextualised Islam exemplifies both how he has been able to take advantage of waning Chechen nationalism in the 1990s and the growing importance of Islam in the region. One of Kadyrov’s main themes is his emphasis on Chechens’ piousness. Actual mosque attendance in Chechnya is quite high, but repeated references to the exceedingly high levels of attendance (e.g. 'Glory to God that in Chechnya, hundreds of thousands of people systematically offer Salawat') obscure the complexity of actual practices. Kadyrov also noted that, 'In the harshest years of the Stalinist terror, our ancestors taught children how to read the Koran'. The implication being that Chechens have defended Islamic values against 'foreign' forces for a long time, thus naturalising its continued presence in peoples’ lives. These communications seem aimed at portraying an actual Islamicisation of Chechnya on the ground. Kadyrov has enforced the spread of religious schools, introduced head garments for girls and young women in school and university, and he has restricted the sale of alcohol in the republic. In many ways, Chechnya now rivals Muslim-majority countries in its adoption of aspects of Sharia law. 'Declare your jihad against the 12 enemies you cannot see: egoism, doubt, greed [etc.]' From Ramzan Kadyrov's Instagram.Asserting life in Chechnya as 'Islamic' hints at Kadyrov’s continued obsession with combating his Salafist enemies in the North Caucasus. Kadyrov can show that he has been more successful than them in 'Islamisising' Chechnya. Kadyrov's implication is that he, as a leader, derives his guidance from God. In 2007, journalist Andrei Smirnov recounted the events of the day Kadyrov was appointed as leader: instead of staying in his home village of Tsentoroi to meet with Russian officials who had come to congratulate him, Kadyrov instead visited the tombs (ziyarts) of important religious figures in Chechen history. It was a symbolic act that positioned Kadyrov as the disciple and heir to those leaders – a concept central to Kadyrov’s struggle for succession. It also indicated the nature of Kadyrov’s future political career as a competition for sacred authority in politics. Sport also plays a large role in creating a sense of national identity. 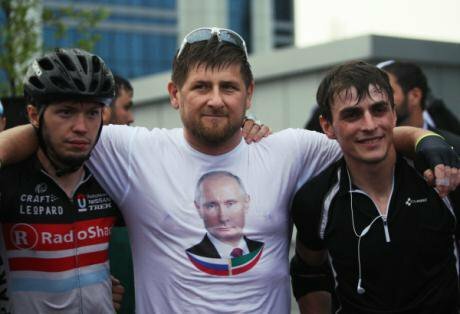 Kadyrov keenly supports Chechen athletes online, pushing for more sporting facilities in Chechnya. The promotion of sport on Instagram allows Chechens to support a broader national order beyond the authorities and regime. Chechnya’s competitiveness and the victories of Chechen athletes are important in their ability to reinforce a positive image of Kadyrov’s rule. It is an articulation of success when other sources of legitimacy – such as democracy – are absent. As during the Cold War, sport becomes a display of the superiority of the political system that produces the athletes. On Instagram, Kadyrov encourages seeing the Russian state as the vehicle for Chechen victories internationally. The concept becomes part of a larger, Russian ideological framework in which the Russian state uses Chechens in a sublimated war internationally. Such valourising of Chechen male bodies might be politically advantageous for Kadyrov, but it is also fraught with historical problems. As recently as the 1990s, Chechnya was the site of two devastating wars in which tens of thousands of Chechens were killed by the Russian army. In November 1999, Russia declared all Chechen males between the ages of 10 and 60 to be potential fighters. Today, the disaporan Chechen population of Russia – and Chechen males in particular – are criminalized – harassed by police, often detained and beaten. Kadyrov's offer of an occasion to celebrate the Russian state is an attempt to change that relationship. Sport, piety, Putin: Ramzan Kadyrov at Russia Day celebrations in Grozny, 2014. Photo (c) Said Tsarnaev / VisualRIAN A great deal of Kadyrov’s Instagram posts feature him, often with his friends and associates, working out at the gym, a celebration of hyper-masculinity. By showing himself as someone who stays fit – by implication, on top of events – the Chechen leader suggests his ability to defend national interests. As he wrote in a post from 2014, 'Dear friends! There is a strict rule – a commander should serve as an example for his subordinates. This relates to both military and physical preparedness'. In the past, leaders’ masculine image used to come from leading troops into battle. In peacetime, sport can perform the same function. It may seem that Kadyrov copies Vladimir Putin in his display of masculinity for political gain. Unlike the unsentimental and stern portrayals of the Russian president, Kadyrov’s Instagram presents him not only as strong, but likeable too. He jokes with friends and talks about how vivacious and cheerful he feels after a workout. Such communications reveal the relationship between social media and state power as one that manufactures consent and legitimacy. Instagram creates a space for Kadyrov’s audience to connect emotionally with him in a sort of parasocial relationship, encouraged by the seemingly casual and intimate nature of the posts. Part of this scheme involves simultaneously increasing political legitimacy by drawing renewed attention to existential threats to Russia, from internal sources such as pro-democracy and human rights advocates, as well as external dangers such as international terrorism – most recently in Syria. Kadyrov, by drawing attention to threats from Salafi Islam and the West, tries to turn himself into a guardian not just for Chechnya, but for the Russian Federation as a whole.He thereby opens new political opportunities for expanding his politics beyond Chechnya. In early October, as Russian planes began bombing Syria, Kadyrov asked Vladimir Putin to send him there. He referred to a statement made in 1999, when Chechens supposedly took an oath to fight against “them” (presumably Salafists) for all their lives, wherever they are. Kadyrov wants to play a role in any ground operation in Syria, both to display his authority and to score victories against his personal enemies – Chechens who have left to fight for Islamic State. In the meantime, all he can do is remind Putin and the world of his authority – a job made infinitely easier through his program of soft authoritarianism.